The flight suit will be dark gray in color and have the standard Mandalorian double-sleeve. The neck seal will be a straight tube with light padding inside of it. It has a small tuck on the top. It is slightly higher in the back and under the jaw line in the front. There is a 2-inch blue stripe down the outside of both legs from the belt to ankle. There is a 1-inch edging above and below both knees. Although there is some CGI cheat in TCW, there is NO correlation for the use of a spat. The vest is Jango Fett style, black in color. The exterior of the cape is a light blue color with dark gray stripes stylized stripes. There is a dark blue Death Watch sigil in the center on both sides. It is clasp around the neck with a black band. Palladium Boots Pampa high canvas are the best match found to date. They are recommended as the boot to use. Dark brown leather or leather look fabric approximately 1″ wider than ammo belt at top and bottom. The front piece of the belt is 1.5-inches wide. The top piece has a ½-inch wide and 2.5-inch high pill-shaped hold cut in it. A ¼-inch wide piece is located on either side of the ‘buckle.’ Then a 1-inch, then a ½-inch, then a 3-inch are located on either side of those. The next 3-inch piece will have a 2-inch wide sky blue stripe opposite the buckle (in line with the leg stripes). The next pieces will be 2-inches wide and have a 1-inch wide 1-inch high square with rounded edges cut in it. If the above measurements are not enough to place the sky blue stripes in the correct location, then modify them to do so. The back of the belt will include similar pieces to cover the entire length. The back piece will be a 3-inch piece with a 2-inch wide, 2-inch high hole in the center as with the sidepieces. Color gunmetal grey or black. 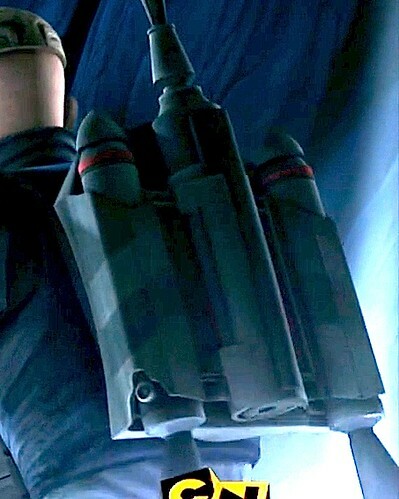 Black Jango Fett style ammo belt can be used for “real world” armor. The dome and face is painted gunmetal gray. The mandibles and band are a light gray or silver. The cheeks and back are painted blue. Rustoleum Brilliant Blue is preferred. The key slot dent is painted black with a white edge. Finally, stylized three-claw emblem rises from the ring of the faceplate. Color should be Rustoleum Fossil lightly misted with yellow. The helmet should have the narrower design with the longer face and the T should come to points at the ends. There are no diamonds on the forehead of the helmet. The right earcap must match the left. There is no RF. The shoulders are stylized shape, slightly curving inward on the sides. They are Rustoleum brilliant blue in color weathered through slightly with a gunmetal base. The left has a red detail with a white edging ranks sigil. Refer to pix for details of sigil. Standard Jango Fett template with applied sigils for real world armor. The neck plate is stylized shape (flat across the bottom). It is Rustoleum brilliant blue in color weathered through slightly with a gunmetal base. Finally, there is a black 2-inch wide stripe in the center. Standard Jango Fett pattern with proper colors and sigils for real world armor. The left chest plate is based on the WOF template, but it is in a stylized shape (flat across the top and a thicker ‘ear’). It is gunmetal gray in color and weathered through slightly. The chest slots are should not be cut out . The slots should be painted red and blue to match the artwork. Standard Jango Fett pattern with proper colors and lighting for real world armor. The right chest plate is based on the WOF template, but it is in a stylized shape (flat across the top and a thicker ‘ear’). It is gunmetal gray in color and weathered slightly. 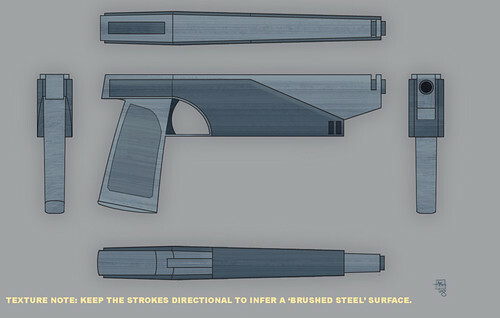 Standard Jango Fett pattern for real world armor. The diamond is made from the WOF template. The center rectangle is raised. The color is sky blue with the edge weathered through to gunmetal. The rectangle should be gunmetal. The ab plate is identical the WOF template. It is gunmetal in color and weathered through slightly. The back plate is identical to the WOF template and curved slightly around the torso at the edges (as per the WOF template). It is Rustoleum brilliant blue across the upper back and gunmetal on the rest. The cod armor is in a stylized shape more of a triangle than the normal cod shape. Standard Boba Fett or Jango Fett pattern (no dents) for real world armor. The thigh armor is a completely custom design and is stylized in shape and curved slightly around the leg. The plate rides on the outside of the thigh rather than on the front of the thigh. The holsters are built into the thigh plate and appear as part of the armor. They are gunmetal gray in color, and have a Rustoleum brilliant blue stripe in line with the stripe on the flight suit, weathered through slightly. Although a stylized piece, it is a representation of the era and characters. This piece MUST be replicated for real world armor. The knee plate is a completely custom design (based on the generic Mando knee) and is stylized in shape. The face is more square and flat than normal. The base color is gunmetal gray and the sides are Rustoleum brilliant blue and slightly weathered. Standard Fett knee’s, no dents, no dart launchers are acceptable for real world armor. The shin armor is based on the WOF template, but it is in a stylized symmetrical shape that is identical on both legs and both sides of the plate. They are gunmetal gray in color with Rustoleum brilliant blue stripes on either side. The blue stripes will begin at the flight suit stripe and go down either side of the face. Standard Jango Fett pattern shins for real world armor. Required only for both animated and real world armor build. Standard Fett pattern boot armor is to be used for real world style. Near the ankle, the armor should be sky blue in color. The bottom 3/4 of the plate should be gunmetal in color and have an oval shape, not unlike a capital O. It should be slightly weathered through. The hand plates are a completely custom design in a ‘tombstone’ shape. They are gunmetal gray in color and weathered slightly through. The gauntlets are a completely custom design. They are a set of clamshell cylinder gauntlets. There is a notch on the top which is approximately 3-inches wide and 1-inch long. In front of it is a long box that is ½-inch high, 3-inches wide, and runs ½-inch from the edge of the elbow and wrist of the gauntlet. Another ½-inch box fits on the top that is approximately 3/8ths of the length of the original box. The edges all fade with a 60-degree edge except for the top that is a 45-degre angle. There are two small rectangles on the top outside of each gauntlet. They are gunmetal gray in color and slightly weathered through. The right gauntlet must have the red sigil worn by the character. This type of simple gauntlet is required for both animated and real world armor. The Jetpack will be a custom fusion of the Jango Fett Geonosis “Arena” jetpack with the top missile is the missile from the Mitrinomon Z-6 Jetpack. The paint pattern should be applied silver or gunmetal with red accents as depicted in the animated artwork(img). The pistols are silver/chrome in color. The pistols may both be built of equal size to fit in the thigh holsters. Refer to this picture for the build. The darksaber is a required component of the Pre Vizsla Build animated or real world. No blade is required, only the hilt. The handle of the darksaber is rectangular. The darksaber hilt is much longer than the traditional lightsaber hilt. It is gunmetal or black in color. There is a rectangular shaped pommel guard approximately 3/4 up the overall length of the handle. The pommel guard slopes upwards on the front side of the saber. The portion of the hilt extending beyond the pommel guard is ribbed and silver in color. There is a small rectangular shaped emitter at the top of the hilt. This emitter is wedge cut and hollow. An Obi Wan Kenobi replica lightsaber may be worn attached to the belt on the left hip.